This is Ivy and she is only 14 years old. She has a knack for baking and decorating wouldn't you say? Her and her mom were trying to find the perfect almond cake recipe for Ivy's first wedding cake order. They had trouble with the recipes they were using and needed a little help with the construction part too. Thankfully they discovered Wedding Cakes With Lorelie Step-by-Step. They shared this great shot of Ivy and actually called me to let me know how excited they were to have found my recipes and instructions in my e-Books. Congratulations Ivy !!! 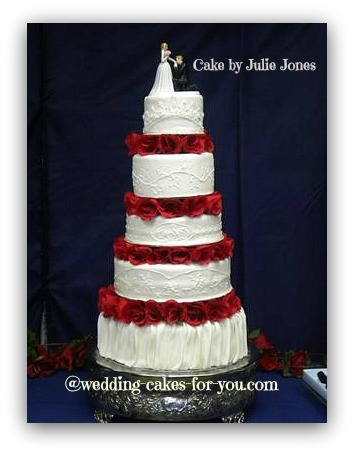 Show Us Your Wedding Cakes! Enter A Title For Your Cake! PLEASE READ ALL OF THIS BEFORE MOVING FORWARD WITH YOUR ENTRY. Thanks. Tell us how you did it! What inspired you. 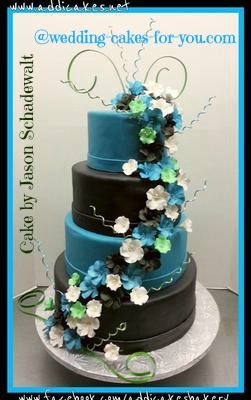 Include at least one tip or something that you learned while making and decorating your cake, include a recipe with details or share a cake decorating technique. IF YOU ARE entering one of the contests-Please Read The Official Rules Before doing so. After you submit your entry, you will go to a screen that gives directions for INCLUDING YOUR EMAIL ADDRESS. Click the button to receive notification of your submission this way you will be informed of comments that others leave and I can contact you if you are chosen as a winner. Your title and text may get changed slightly with keyword additions to help the search engines find your entry. How did you do it-cake decorating techniques? Did you get tips from this website? 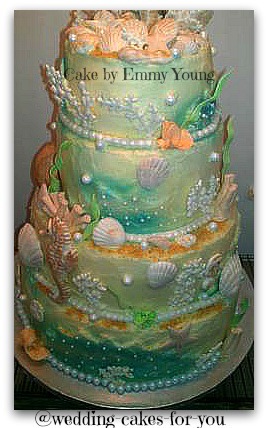 How did it make you feel to accomplish your amazing cake? Include the recipe or recipes that you used. Your story will appear on a Web page exactly the way you enter it here. (unless I need to tweak it a little) You can wrap a word in square brackets to make it appear bold. For example [my story] would show as my story on the Web page containing your story. IMPORTANT: Ask your friends and family to rate and comment. They must add their names to the comment or it will not be counted. *Please include your email address so that I may reach you if you should win. (I will not share that information with anyone)Thanks. TIP: Since most people scan Web pages, include your best thoughts in your first paragraph and include your title in that paragraph. NOTE:If for some reason you cannot upload a picture you an send it as an attachment in an email to me at cpastrychef@gmail.com and I will upload it for you. Click below to see what others have shared or entered and see what kind of comments and ratings they are receiving! Congratulations to all of the 2013 Wedding Cake Contest Finalists! IMPORTANT !!! 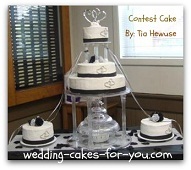 Please read the wedding cake contest guidelines first before entering and check out the prizes. 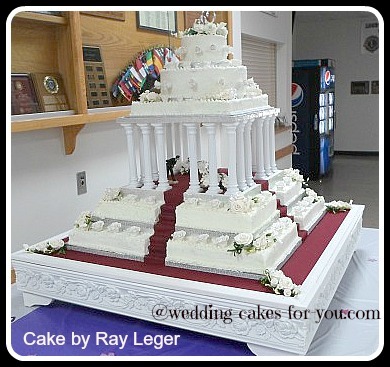 Rays Leger's cake was chosen to win the September wedding cake contest. Congratulations Ray!!! Ray Leger from (Moncto NB Canada) built an original from the ground up. When he found out that his son, who said he would never marry, was indeed going to tie the knot, he surprised him and his new wife with this amazing original design. And it was his first. Wow! Emmy Young of (Bena, MN) crafted a gorgeous design with soft pastels and shells made of gumpaste complete with a white chocolate dreamcatcher. She is proud as she should be, this is a beauty and it sounds like it was quite delicious. 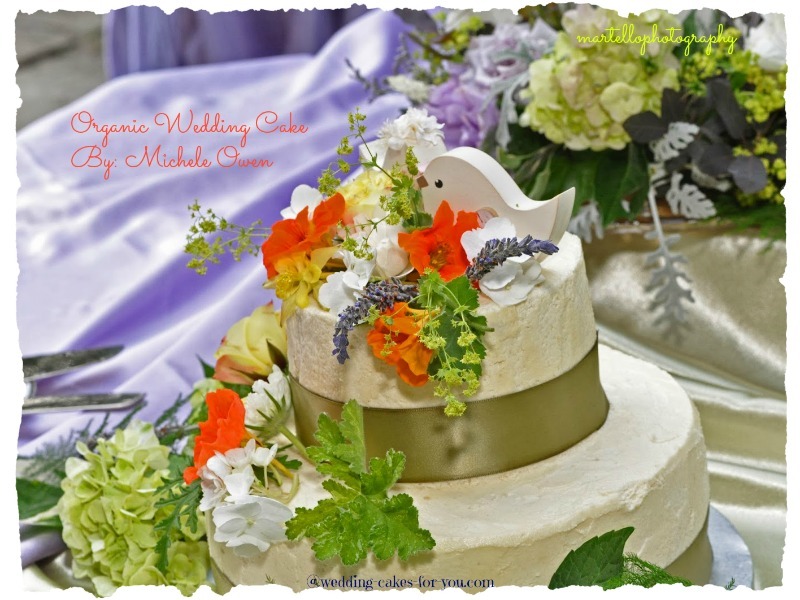 Angel Rushing from Clarkesville, GA found Youtube to be very helpful and is where she learned how to make gumpaste flowers and found the design inspirations for her fantastic wedding cake. Read her story and the all of the outstanding commentary by her avid followers. Wow! 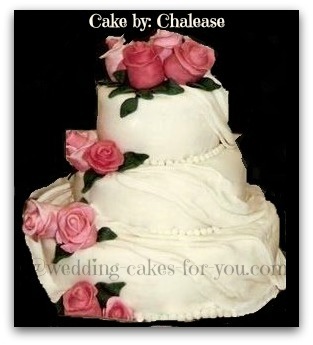 Chalease also from Georgia entered her very sweet draped wedding cake. Her mom put this together for her on very short notice and surprised her with it's beauty and meaning. A classic story of love and appreciation pulls at the heart strings.Thank you Chelease for your beautiful entry. Angel's cake was chosen because she had an overwhelming response from friends and visitors with amazing comments and testimonials. Her decoration was impeccable and her essay informative and helpful. 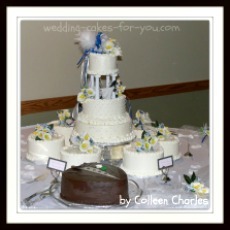 Two wonderful wedding cakes with beautiful stories were entered into February's wedding cake contest. 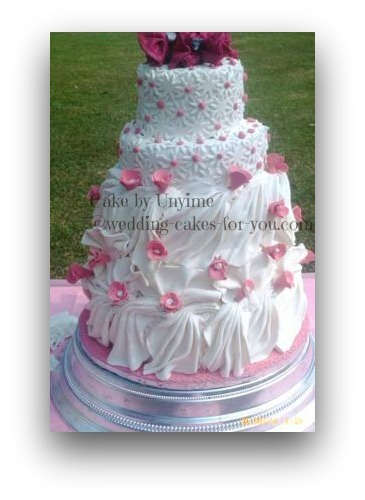 Unyime of Nigeria miraculously made this draped fondant cake with fondant flowers with almost no tools or resources. The challenges she faced were great, but she had a great attitude and accomplished something pretty spectacular. Jason from Freeport Illinois also had a very heartfelt beautiful story about how baking soothed his soul after his fathers passing. He and his wife opened a bakery and named it after their daughter Addison. 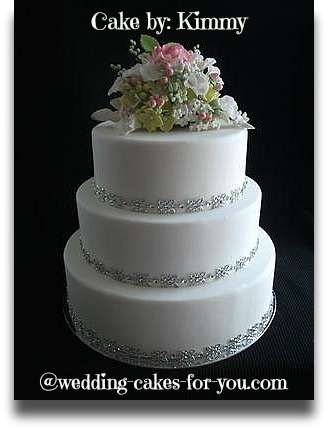 His cake is absolutely gorgeous and very polished and professional. It is so hard to pick a winner, but with a little help from the facebook friends and family, I chose Unyime as Cake Of The Month. Four competitors for January, and it was such a difficult decision. 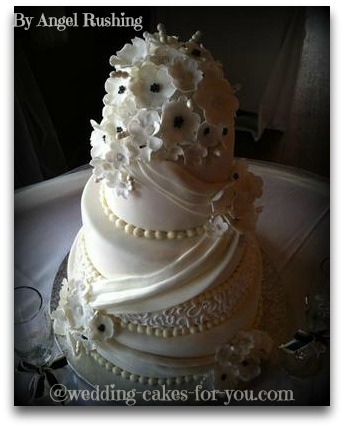 Kimmy added a dummy cake with the most gorgeous sugar flowers and her story is totally awesome as usual (Kimmy has added many cakes to this website) she has also added many great tips and helped countless people with her commentary. 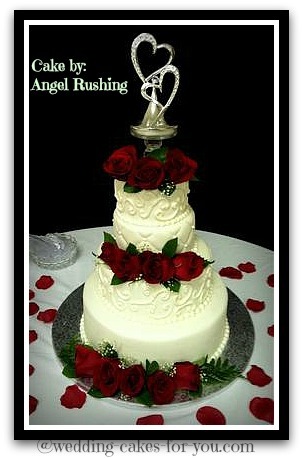 Angel's "Purest Love" cake and story got sooo much attention from visitors and received 37 comments in all with 187 stars. Her cake is lovely and she also added some helpful tips to her story in the comments section. Holly Smith's unique wedding cake/cupcake display is Rustic Elegance at it's best. Holly is very generous with her tips, in fact she goes into great detail about the process of her design and helpful organizing ideas. Angela is excited about someday opening up shop. She has a great story to tell which is very motivational and gives tips as well. It came down to "Every Cake Has A Story", and Angels was hard to beat. The comments were meaningful, people responded the most to it and her cake is beautiful. Congratulations Angel! 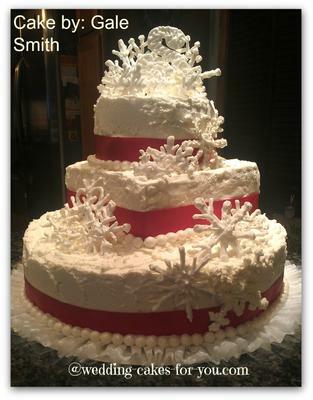 Donnella and Gale competed for the December wedding cake contest win. Once again it was really difficult to choose. Every one of the competitors puts their hearts and souls into it and these two were very close. 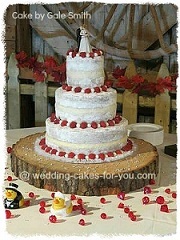 Gale gave us a nice tip on making buttercream less sweet and her Christmas wedding cake is stunning! After reading the very emotional comments from some of the readers I realized that Donnella had the winning entry. Her story affected people and it showed in the commentary. Tammy and Gale competed for November's cake decorator of the month. Both of these wedding cakes are beautiful and the stories were both GREAT. Tammy gave us a couple of good tips on curving fondant daisy flowers using a shower hanger and some plastic wrap and an icing tip for texturizing. Gale's story is full of passion and her cake is unique. It was difficult to choose between these two as it was pretty much a tie. In a case like this I have to go to the comments and use them as a tie breaker. Gale receives the Cake of the Month award. With nine very high quality comments and 45 stars.Thank you both for sharing your remarkable stories! 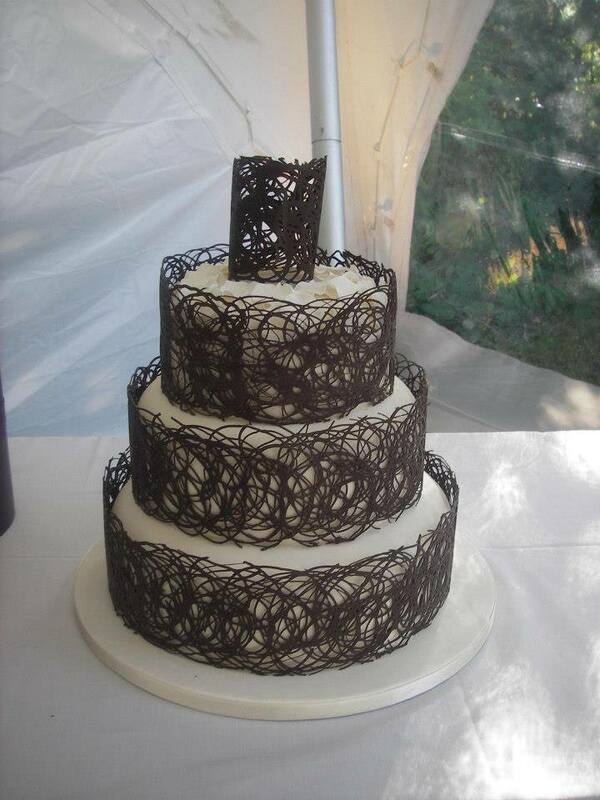 Rebekah Sanchez and Rachel Turner competed for the cake of the month in the October wedding cake contest. Rebekah's story has a lesson in optimism that we all could use and Rachel's passion for cakes shines through. Thank you both for entering and for your wisdom. Thank you Colleen and Laura for your awesome entries. Laura has been the winner for the past two contests with her very detailed work and gumpaste flowers. This time Colleen takes the blue ribbon. Both entries were helpful and included tips and instructions, both made beautiful gumpaste flower arrangements, and both had passion and were well executed. I wish Collen had a close up shot of her cake. I don't always pick the one with the most comments but in this case the passion of Colleens fans was overwhelming. So Congratulations to Colleen Charles! As long as there are two cakes the contest is a go! Laura Leydig Maxey won again, but this time for her fountain cake with stairs and blue buttercream roses. It is a magnificent creation that she made for her daughters wedding. 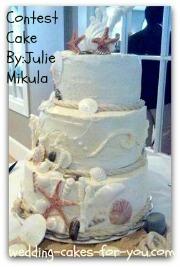 Read about Julia's sea shell cake. She has a tip and a delicious raspberry filling recipe for you. Check out Laura's blue buttercream roses and incredible pillared fountain stairway cake! Once again it was not an easy task to choose a winner. 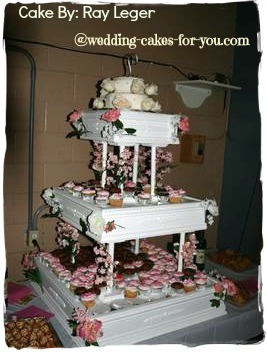 Thank you to ALL of the entrants for adding beauty and creativity to the wedding cake contest pages at Wedding Cakes For You, sharing your ideas, tips and inspiring us all. Click on each photo to go to their story and photos. 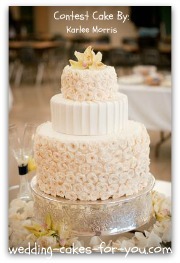 Tanya's cake adventures began with a book from the Hobby Lobby and her passion grew form there. 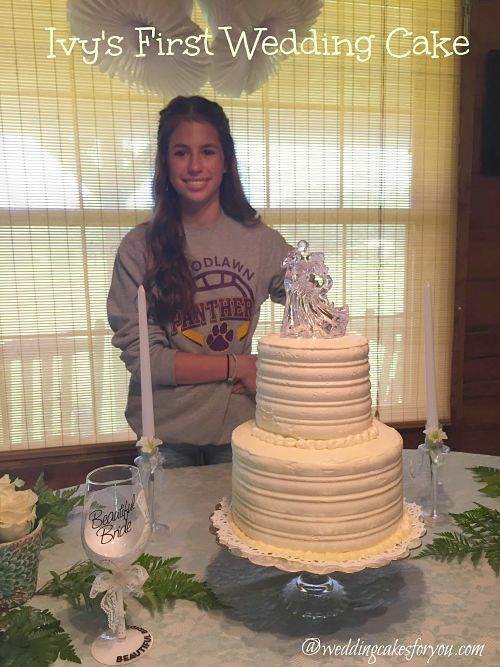 Mariah made her sisters country wedding cake and gives us a smooth buttercream tip. 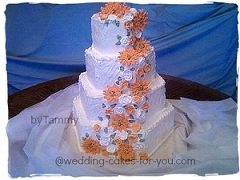 Laura (the featured cake decorator this month) made all of the gumpaste flowers on her design by hand. 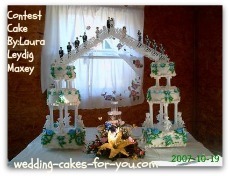 Inoka made the floating cakes for her brothers wedding and is planning on becoming a professional. Karlee has a thing for cake decorating shows and she made her own wedding cake. 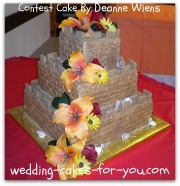 Deanne entered a beautiful sand castle design and her story is hilarious! Thank you to the four competitors of the June contest. There is so much talent out there, it never ceases to amaze. Your contributions to this website are so important in making this a friendly place to visit for real information and inspiration! Athalia made an amazing whimsical topsy turvy creation using Cake Stackers. She talks about using them and gives a couple of tips. Heather made a gorgeous cake for her daughters wedding cake. This is a story of true love. Tia's story began when her grandmother taught her how to bake and decorate. She used her earnings from the cake sales to fund her college education. Patricia asked and she received. She was having some issues with fondant and got the answers right here at this website. She returns the favor by adding her tips on using sugarpaste. 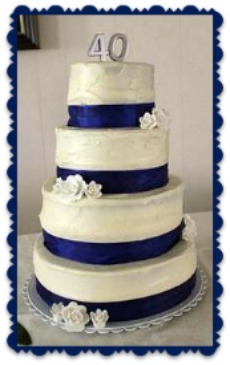 Leslie used the grooms favorite flavor and the brides favorite color to inspire her unique blue theme. 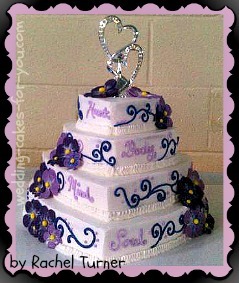 Mildred created a gorgeous and very meaningful 50th Anniversary cake for her parents to celebrate their love. 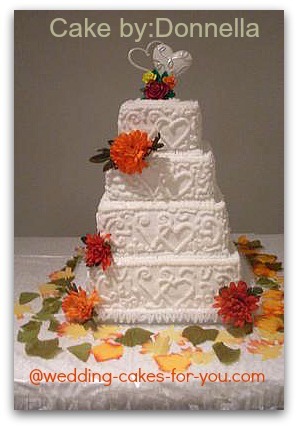 Roy added his green fondant Love Tree design to the wedding cake contest. He made his own cake stand and added some great tips for you from his experience. 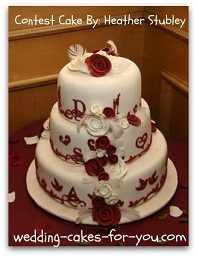 Teresa created a first fondant cake for a sweet couple who could not afford a fancy confection. 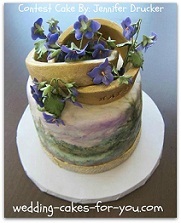 She adds a couple of tips about fondant decorating too. Debbie's fall wedding cake has tiny gumpaste acorns and leaves. She also added her racing car grooms cake. Kimmy tells a funny story about her penguin cake. You have to read it. Its a little risque. Colleen was surprised when her clients decided they wanted a hunting theme. She made a very cool camouflage design to please. 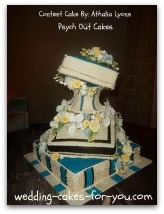 Debi says her 4 tiered blue design was a confidence builder and she plans on going pro someday too.